Kim Jong-un has kicked off a five-day spectacle to mark the seventh congress of the Workers’ Party on Friday by riding a nuclear missile. 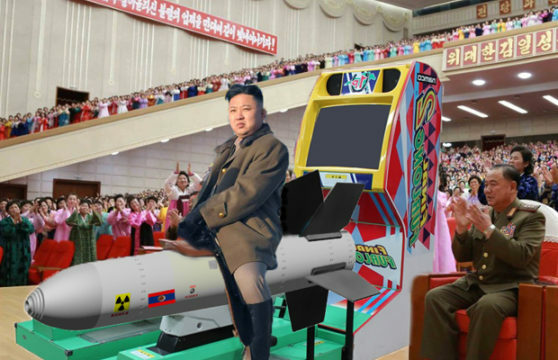 The young dictator was keen to impress dignitaries with his rare appearance, and took the opportunity to showcase North Korea’s military prowess. But foreign analysts have remained skeptical. “If you look closely at the images it’s pretty clear that it’s a makeshift missile case welded onto Final Furlong,” said one analyst. North Korea is believed to have kidnapped several Final Furlong machines back in the late 1990s. Insiders have suggested that the supreme leader attached missiles to the machines after realizing there simply weren’t enough carrots supplied at the beginning of the race for him to beat the other computer horses.